1. The highest percentage of natural gypsum possible. 2. The lowest amount of pre-consumer recycled content. 3. A preference for post-consumer recycled content. When using healthier drywall products, encourage your contractor to separate waste for recycling. Watch this short video on recycling drywall. This is Why: While one drywall board may look very much like another, there are important differences. All drywall (also known as gypsum board, or wallboard) is comprised of a mineral core of gypsum with kraft paper facings, and a small percentage of additives. However, some boards are moisture-resistant (their paper facings are sometimes green), others are fire-resistant (known as Type-X). Rather than kraft paper, boards can be faced with foil when a vapor barrier is needed, with fiberglass when boards must have higher mold and moisture resistance, or with vinyl when specific sanitation standards must be met. The Healthy Building Network’s guidance on the selection of healthy drywall focuses on the core of the boards: the gypsum itself. Gypsum can be mined or quarried from the earth and ground into a powder. Pre-consumer recycled content (synthetic gypsum) is created from environmental control systems installed in the smokestacks of coal-fired power plants. These systems capture particles from coal burning as they travel through the smokestack or flue. This becomes Flue-Gas Desulfurization (FGD) gypsum. Drywall cut-outs and other scrap from new construction are sometimes collected and recycled into new gypsum boards. This scrap can be made from mined, synthetic, or a mixture of both types of gypsum. A small amount of wallboard collected from demolition sites may also be used, but that rarely happens outside the Pacific Northwest. This is known as “post-consumer” recycled content. In areas of North America with gypsum deposits in the ground (particularly the West), boards tend to be made entirely or in large part with mined gypsum. However in areas of the country where coal-fired power plants are plentiful, drywall manufacturers have shifted from mined to synthetic gypsum over the past 15 years. While it may seem counter-intuitive to recommend against recycled content in a high volume building material, the problem is that the use of FGD in drywall results in the global distribution of mercury, a potent developmental and neurotoxic metal that persists in the environment, accumulates in the food chain, and is highly toxic. The very pollution that is being captured in the flue of the power plant is being released from the smokestacks of wallboard factories that use FGD residuals. Over the past decade, wallboard manufacturing plants in the eastern USA released nearly two tons of mercury into the air and into solid waste. Because mercury is persistent in the environment and bioaccumulative (it magnifies in the food chain), it doesn’t disappear, but instead becomes a global pollutant impacting residents of all buildings, all over the world. Graph by Healthy Building Network, 2016. Source: US EPA Toxics Release Inventory data for gypsum product manufacturers. While natural gypsum is not without its environmental impacts -- it is extracted through open-top surface mines powered by drills and explosives -- these impacts do not match the severity of those tied with FGD gypsum. 1. Select drywall with the highest percentage of natural gypsum possible. Do this by reviewing Technical Data Sheets, LEED sheets, recycled content certifications, or other product literature. These sources will often provide a breakdown of the pre-consumer and post-consumer recycled content used in boards made at each of the company’s facilities. 2. Prefer drywall boards with the lowest amount of pre-consumer recycled content you can find. This is because FGD gypsum is classified as pre-consumer recycled content, and appears this way on most product literature. Below is an excerpt from one manufacturer’s product literature that lists the recycled content composition of its boards. You can see that the boards made in plants marked by red arrows contain high amounts of pre-consumer recycled content (FGD). The boards made in plants marked with green arrows do not and are therefore made with mined gypsum. 3. Look for drywall boards with post-consumer recycled content when you can. Currently, most post-consumer recycled content of drywall refers to the paper used in the facings, although construction trim scrap is gaining thanks to existing programs in the Pacific Northwest, and new innovations championed by the Building Product Ecosystems collaboration. Through their Evolving Wallboard Systems initiative, efforts are underway to collect drywall scrap from worksites and reprocess them into new wallboard. Be on the look-out for the future availability of wallboard with this additional post-consumer content in the future, and consider how your projects can separate wallboard waste for recycling. *Turning FGD residuals into recycled content products also produces other health hazards. Plant operators have options for how best to capture this mercury, however they often choose to use a technology based on bromine because the resulting FGD has a better resale value to manufacturers seeking to incorporate it into their products, including in drywall. Incorporating bromine into the FGD creates carcinogenic compounds, called trihalomethanes, that get released into wastewater systems. VanBriesen, Jeanne M. “Potential Drinking Water Effects of Bromide Discharges from Coal-Fired Electric Power Plants.” US Environmental Protection Agency, August 17, 2014. https://www3.epa.gov/region1/npdes/merrimackstation/pdfs/Comments2RevisedDraftPermit/VanBriesenReport.pdf. Data for Mercury Emissions graph was gathered by Healthy Building Network using the Environmental Protection Agency’s Toxics Release Inventory. 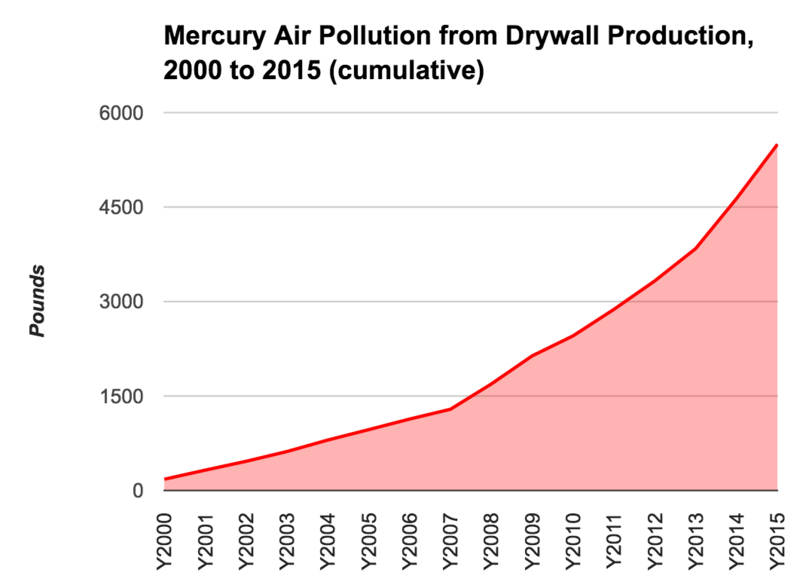 Emissions of mercury and mercury compounds reported to the agency from any US drywall manufacturing locations in the years 2006 - 2015 were included.